It is a verity of culinary history that a local cuisine is based on things which were indigenous to the local environment. But traditional foods can be influenced by foreign imports. People don't always realise that tomatoes, peppers and other features of modern Italian cuisine began their history as foods far away (in those cases the Americas). Only since the Middle Ages have certain crops been introduced beyond their places of origin. The cardoon has done less wandering than its better-known cousin, the more aristocratic artichoke. Yet thistles similar to the cardoon grow wild around the world - the thistle flower is the traditional symbol of Scotland. Sicily just happens to be one of the few places where the stalks of certain types of thistle are consumed. Here the dish is called carduna, from the Latin term carduus (which is the plant's principal genus). The Italian word cardo is more generic and does not refer to a specific scientific family; in North America certain types of thistle are similar to the cardoon and some are the same varieties, having been introduced into Mexico and California by the Spaniards. Thistles have prickly stems and leaves and rounded heads of purple, violet or pinkish flowers. They are related to certain kinds of daisies. The cardoon, "artichoke thistle" or "musk thistle," is in the asteraceae family. Its stalks are similar to those of the artichoke - another thistle in the asteraceae family indigenous to Sicily - and have a similar taste and texture. Only in the eighteenth century were these plants identified scientifically, though they had obviously been consumed for millennia. The cardoon is mentioned anciently in Egypt and Ethiopia, and makes an appearance in both Greek and Norse mythology. The cardoon most often consumed in Sicily is the cynara cardunculus, which is indeed closely related to the artichoke, cynara scolymus. The leaves and stalks of the two plants are nearly identical; it's the flowers that are different. Artichokes are harvested in late autumn and again in early spring, but the cardoon stalk is usually picked once annually, beginning in early December. 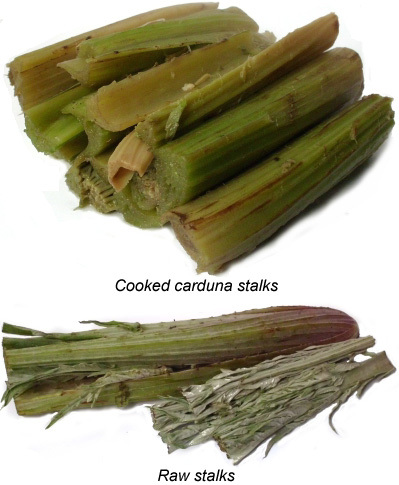 Bearing a vague resemblance to celery, the cardoon stalk is high in potassium, low in sodium, and is a good source of B vitamins, folate, magnesium, calcium and iron. For all its nutritional benefit and delicious taste, the cardoon enjoys little more than a cult following among gourmands and aficionados beyond the Mediterranean. It seems to be regarded as the "poor cousin" of the more famous artichoke. Genuine cardoons don't grow everywhere. In North America and parts of northern Europe it may be possible to substitute certain wild thistle stalks for cardoons. These may be tougher and therefore require longer boiling during preparation - for 15 or 20 minutes. They may also be thinner, yet probably not much more bitter than the true cardoon. Yes, cardoon stalks are rather bitter. Preparation for cooking begins with cutting the long stalks and removing some of the tough external fibres. Next the stalks are boiled (with a little salt) in a large pot for at least ten minutes. This is the cooking stage, and if you prefer you can eat the stalks this way, but in Sicily the carduna is rarely served after having been merely boiled. Instead, it is then lightly battered (dipped in whole egg, dredged through flour and then perhaps rolled in bread crumbs with a bit of pepper and finely grated cheese) and quickly fried. A heavy, pasty batter should not be used, and the cardoons should not be deep fried, but quickly pan fried in a mixture of corn oil (perhaps 70%) and refined olive oil. Carduna is served simply, without dressings or dips. Tasting it with a bit of horseradish or wasabi sauce, or even Dijon mustard, while not grounds for trial on heresy charges, is less than traditional. Sicilians prefer - if anything - a generous splash of fresh lemon juice.